The Bure Valley Railway is fast becoming one of England’s premier narrow gauge railways, offering a service second to none to the enthusiast, traveller and tourist in all seasons of the year. Our steam and diesel trains pass through scenery which is as varied, interesting and beautiful as any to be found on a railway journey in England. Between Aylsham and Wroxham there are three intermediate stations at Brampton, Buxton and Coltishall, all of which have their own characteristics and, if time permits, can form part of a fascinating day exploring the Bure Valley by rail and foot or bicycle. The main station of the line is situated in the middle of the market town of Aylsham. Although it is now a terminus, you can easily imagine where a bridge once took the line under the road (alongside our café) and beyond. The station buildings here were built in 1989 to a traditional railway design and house a busy railway shop, café and a tourist information centre. The Bure Valley Railway’s workshops are also based at Aylsham and are often open to the public. 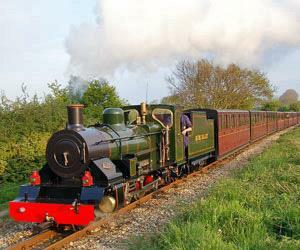 Today’s Bure Valley Railway was built on the track bed of part of the former Great Eastern Railway line between Wroxham and the junction of the Dereham to Wells-next-the-Sea railway at County School. This originally opened on New Years Day in 1880. The site of our station at Aylsham was one of two to serve the town; a bit of an extravagance, but such was the rivalry between railway companies in those days. The second station, named Aylsham North, served the Midland & Great Northern Railway line and was opened in 1883. The line between Aylsham and Wroxham runs through some beautiful countryside and along the way you will catch glimpses of the fledgling River Bure as it makes its way to the sea at Great Yarmouth. You will also see the foot and cycle path which runs the complete length of the railway. 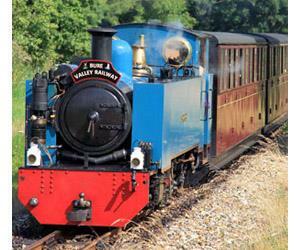 The Bure Valley Railway was officially opened on the 10th July, 1990.